A large explosion in northern Gaza on Tuesday killed a six-year-old girl and injured six other children, Palestinian health officials said. Witnesses said a group of children stumbled upon a homemade rocket or a mortar shell and began playing with it. The device exploded, injuring all seven children, one of whom died later of her wounds. Another boy is in critical condition. 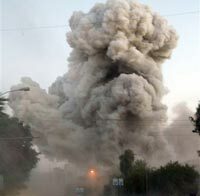 Moaiya Hassanain, a Palestinian health official, said the explosion occurred in the village of Beit Lahiya, in the northern Gaza Strip, and the wounded were evacuated to hospital. The area is a frequent launching pad for militants who fire rockets toward Israel. No Palestinian group accused the army of the explosion. The army often targets militants in air strikes in the region.